A new crop of aerospace firms is taking root. The Atlantic profiled the surging LA County aerospace industry cluster in an article. Read the article below, or at the website of The Atlantic HERE. Los angeles is an open-air museum of aerospace history. It is a city of abandoned missile-defense facilities and stealth-jet assembly plants, of erased airfields and repurposed hangars, flagships of another era standing dormant but unnoticed in plain sight. 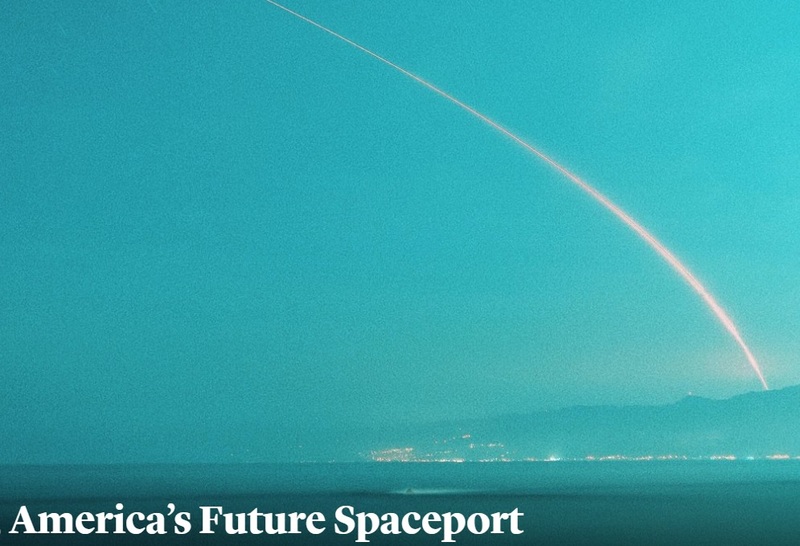 First lost to the secrecy of war, then overlooked as mundane industry, this earlier version of the metropolis is stirring once again, as private space investment promises to turn Southern California into the nation’s spaceport. Los Angeles, city of terrestrial stars, is becoming a gateway to celestial stars anew. “Southern California as we know it would not exist without aerospace,” the historian Peter Westwick has written. The industry transformed the region, in his words, “from a collection of agricultural groves to a sprawling high-tech nexus on the Pacific Rim,” one whose military and financial power spanned the entire 20th century. There is no single reason why this “aerospace century” came to an end in Southern California, although the end of the Space Race and, later, the Cold War’s rapid thaw decreased the industry’s national urgency. Aircraft like the SR-71 were mothballed and replaced. Spy satellite imagery was declassified and put to use in other arenas, seeding the ground for today’s private satellite-mapping renaissance. Some firms packed up entirely, others were swallowed whole by corporate mergers, and the rest moved east, back into the powerful financial and political orbit of Washington, D.C. But aerospace in Los Angeles never completely disappeared. Like fossils hidden in the sand, this previous, sky-bound version of L.A. may be hard to spot, but even its most well-disguised traces are still detectable. In the neighborhoods near LAX, streets bear names such as Jack Northrop Avenue and Rocket Road. At the corner of Wilshire and Fairfax, across from where the Los Angeles County Museum of Art now stands, Cecil B. DeMille ran an airport among the surrounding oil wells. In Playa Vista, a dense neighborhood of new-urbanist condominiums has popped up on land once owned by the eccentric aerospace innovator Howard Hughes. There, Hughes’s design teams built experimental aircraft, including the Spruce Goose, in surroundings now more idyllic than military-industrial. The titanic hangar in which Hughes’s wooden superplane was assembled is now surrounded by pedestrian paths and leased by Google. Across the street, another Hughes hangar still stands, converted into a YouTube production studio. These airfields and hangars, filled with the ghosts of spy planes past, slumbered as L.A.’s celebrity associations took center stage. The city’s hidden history is now waking up. A new crop of aerospace firms is taking root, often in the same buildings as those earlier corporations. They are launching an era of personal satellites, non-state space exploration, and—someday—a private, crewed mission to Mars. Elon Musk’s SpaceX, based in Northrop Grumman’s former factory in Hawthorne, is only the most widely known example of a multibillion-dollar industry rapidly coalescing here, from the Mojave Air and Space Port in the desert north of Los Angeles to the coastal launch pads at Vandenberg Air Force Base, even to the streets and offices near LAX. The sector’s newfound appeal is such that, at the end of April 2018, Jeff Bezos remarked that he could see no other way to spend his Amazon fortune than on private space travel. It was leaving the Earth or bust (or leaving the Earth to gobust, as his critics quickly retorted, rather than, say, raising wages for his own employees). Bezos’s space firm, Blue Origin, is based outside Seattle, not in Southern California, but the broader private space industry is seeing huge windfalls in expenditure from celestial sugar daddies such as Bezos, Richard Branson, and Elon Musk, to name only a few, not to mention lucrative contracts and awards from government agencies like darpa and nasa. North of Los Angeles, just 90 miles into the desert on the other side of the San Andreas Fault, lies the Mojave Air and Space Port. An industrial village of low-slung warehouses and cinder-block workshops, the facility has a peculiar double life: It is both the first facility in the United States to be licensed for horizontal launches of reusable space-capable aircraft, and it is a boneyard for abandoned jets. Aerospace ruins line the northeastern edge of the site in various states of disassembly. The Space Port is also home to a handful of private space companies, including rarefied firms such as Richard Branson’s Virgin Galactic (pending its future move to the firm’s Norman Foster-designed New Mexico headquarters), along with the Spaceship Company, Masten Space Systems, and Scaled Composites. The space firm with one of the oldest footprints at Mojave, however, with a workshop dating back to 1996, is not like the others. While the barrier to entry in this new space race would seem to be billions of dollars in venture capital and a perpetual media spin cycle of TED talks and spectacular live-streamed launches, a company called Interorbital Systems proves that those are just cultural trappings, not technical necessities. With a full-time staff of seven people, Interorbital operates inside a ramshackle building with the air of a mom-and-pop shop. It emanates a scrappy, DIY, bootstrap tenacity, a small-team approach that contrasts with the high-gloss sheen of nearby firms, whose employee rolls often number in the hundreds. It is punk rocketry—complete with a paperback copy of J. G. Ballard’s novel Crash on the office bookshelf.Interorbital is run by the wife-and-husband team of Randa and Rod Milliron, who split their time between Mojave and a home in Hollywood. The company is determined to burn its own path to space. Interorbital’s goal is a more flexible launch platform, a quick and dirty way to get payloads into orbit. “Wherever you take it becomes the launch site,” Randa explains, describing her hopes for how the firm’s first modular rocket, the Neptune 1, will be used. Interorbital’s ideal scenario would eliminate permanent launch facilities altogether in favor of portable, turnkey hardware capable of getting objects—and people—into space on short notice.The firm’s streamlined operation overlaps uncannily well with the darpa Launch Challenge, announced in April 2018, which aims to accelerate launch capabilities from months or even years to mere days. Darpa’s goal is to encourage “flexibility and resilience” over “one-of-a-kind, fixed infrastructure.” The kind of pop-up, on-demand launch capabilities pursued by Interorbital since the late 1990s will make them a team to watch when the Challenge unfolds later this year. In the context of the larger private space industry, Randa’s personal story suggests that the dominant media narrative of alpha-male billionaires hedge-funding their way past each other into space is incomplete or misleading. There are other players in the game, developing other ways to leave the Earth.In the 1990s, she and Rod were living in Berlin, Germany, performing in an industrial new-wave synth band called H-Bomb White Noise, while Rod worked toward an advanced biochemistry degree. Before that, the two had bought the shell of a building in Bedford-Stuyvesant, Brooklyn, with the goal of rehabilitating it. From Berlin, they moved west to the dust and mountains of Mojave. More than once, Randa compared these locations favorably, pointing to a mix of fringe artistic and scientific pursuits stretching from their apartment squats in Berlin to abandoned buildings in Brooklyn to the cluttered rocket labs here in the desert north of Los Angeles. If the Millirons have their way, of course, their next move will be to an even wilder periphery, a vertical emigration to the moon—or beyond. These aren’t mere slogans: Interorbital has been running a series of outreach courses aimed at “sponsoring and inspiring the next generation of scientists and engineers.” These courses are geared toward high-school and university students in overlooked neighborhoods such as Compton, and, Randa explained, are as much about inspiring the broader public to remain interested in space travel as they are about training future engineers.“We thought it was important to show people what goes into a system like this,” she says, “and to give them the skill set needed to do the hands-on work, to actually make something happen, to create something from nothing, to take a raw piece of metal and turn it into a precision part that takes something to space.” This could be as simple as polishing a rocket tube, she says, bringing it up to the appropriate luster. “Touching the metal transforms it—and it transforms them, as well,” she says. Randa has a tendency to make aerospace work sound like alchemy, a transformation of base matter into rocket parts, of earthly materials morphed into otherworldly tools that will bring us beyond the Earth entirely. Bits and pieces of this future are taking shape throughout Southern California, from experimental rocket sites in the desert and precision machine shops in Los Angeles to satellites launched from the coast. Dense fog was rolling in from the Pacific as I crested a hill north of Lompoc, an Air Force bedroom town about three hours northwest from Los Angeles. I had driven there to witness the first interplanetary launch in the history of the West Coast, scheduled for 4:05 a.m. on Saturday, May 5, 2018. Nasa would be sending the 800-pound InSight lander from Southern California to Mars. There, among other things, InSight would perform seismic experiments and look for signs of Martian life. One important change that brought interplanetary rocketry to the West Coast, nasa spokespeople explain, was pure technical power. Launches from the East Coast, using Florida’s famed Cape Canaveral, have at least two benefits: Rockets can follow a safe, eastward arc over the open expanse of the Atlantic Ocean, and, in the process, they gain a slight boost from the Earth’s rotation. From Vandenberg Air Force Base, however, a sprawling site overlooking the Pacific, rockets have only one sensible option: a southern route over the sea. Until the advent of the Atlas V rocket in 2002, however, there hadn’t been the power to launch south and pursue what nasa calls a “planetary trajectory.” As technology improves, so does California’s appeal as a launch site. More rockets will be coming.It was clear upon arrival that this launch was a big deal for Lompoc. Emergency road signs were already up and nearly every hotel in town was sold out. Extended families, from infants to grandparents, stood impatiently waiting in long lines waiting to check in. When I said I was there to watch the launch, the hotel clerk handed me a free mug and a mouse pad printed with mission to mars before rushing off to help another of many more customers behind me. It felt like a site of pilgrimage: strangers gathering to watch an artificial object ascend into the sky. There would be two official launch-watch parties in town that night, both of them open to the public and kicking off around 2:30 in the morning. One was at the local airport and the other was a little farther up the hill, at St. Mary’s Episcopal Church. I went to bed at 8:30 p.m., set my alarm for 2:30 a.m., and chose the church. What better way to say goodbye to something leaving our world than to meet at a house of worship? By 3:30am, fog had settled in thick walls across parking lots and busy intersections. The town itself was bustling. Volunteers were outside directing traffic with flashlights, waving drivers toward empty expanses of grassy roadside where they could leave their cars in peace. Up at the church itself, one of the organizers estimated 400 to 500 people had congregated, many of whom had brought picnic blankets, tripods, expensive cameras, and foldout chairs. There was free coffee and tea. One couple had driven all the way from Portland, Oregon; another had come down from San Luis Obispo, a mere hour’s journey up the coast. There were college students in Sacramento State sweatshirts. Children in pajamas. Official Air Force photographers in camouflage gear taking crowd shots. A man in a Stranger Things sweatshirt wandered through the room with a grin.One side of the church activity room was given over to folding tables covered with nasa stickers and informational literature about the mission. I joined a small crowd there to listen to an officer from Vandenberg Air Force Base patiently explain the physics behind pressurized helium and advances in the composites industry. He compared the materials behind today’s spaceship design to those used in maritime craft, including surfboards and competitive sailboats, conjuring a vision of tomorrow’s space travel that resembled sending ships out to sea. YouTube is full of videos taken by people standing at the ends of runways filming exotic or unusual airplanes, of people tracking down trains they’ve never seen before and cargo ships coming into harbor. This gathering in the church felt like an extension of the same curiosity, a kind of infrastructural tourism with its eye on other planets. In many ways, the night was notable precisely because it did notfeel like science fiction. As the officer spoke, an open door across the courtyard offered a glimpse of the church’s altar, suggesting the company of the sacred; just to its left, with a view across the valley, a more secular presence stood somewhere in the fog: nasa’s giant rocket, awaiting its launch. Despite the weather, the launch proceeded on schedule. Audio from the launch pad was played over loudspeakers inside the church but, as the countdown began, everyone had already gone outside. Standing there, shoulder to shoulder, tripods pointed into the mist, the parking-lot lights above us extinguished to allow greater visibility, we heard a growing rumble in the darkness. Subtly, the ground began to tremble.As a sound like a dragon’s roar emerged from the fog, the valley ahead of us remained unlit, its dense, medieval haze instead rippling with the sound of … CONTINUED AT THE ATLANTIC WEBSITE.